1) Nepal is South Asia’s third poorest country, with 33.9 per cent of the population living in extreme poverty. 2) Nepal’s unemployment rate hovers around the 50 per cent mark. 3) Its capital Kathmandu is ranked the fifth most polluted city in the world. 4) Half of the world’s unsafe aircraft are in Nepal. 5) Nepal has one of the world’s worst download speeds. About 60 per cent people surf the Internet with a speed lower than 256 kbps. 6) Daily power cuts in the country extend up to 12 hours, badly affecting industry and daily life. 7) Nepal ranks 110th out of 144 countries in gender parity on the 2016 Global Gender Index. 8) Out of the total paid employees in Nepal, only 26 per cent are women. Only 8.3 per cent of women in the labour force are paid. 9) 50 cent of students in primary school will drop out before secondary school. 10) Nepal has the third highest rate of childhood marriage in Asia. 11) Majority of the taxis would be eligible to compete in a vintage car rally. 12) Public infrastructure is something Nepalis have never heard of. Stop it! Stop it! Enough! I am not a doom merchant. I am a global citizen desperately seeking a peaceful place to co-exist with. And out of the 196 nations in the world, there is just one name so far on my list, which is this former monarchy. Ask me why. My notion about a good nation is not swanky skyscrapers, shining pathways, impeccable automobiles, super fast Internet that downloads movies in a split second, or magical tourist spots. It’s about how comfortable and at home you are in the host country and how less foreign you feel while dealing with its people and system. It’s about freeing your soul from the confines of being a stranger to fellow human beings. It’s about the freedom to roam around without the fear of getting lynched by religious vigilantes, like the way it happens in my home country. It’s about the freedom to savour a drink without the risk of a racist or a xenophobe sitting next to you, pulling a gun on you, like the way it happens in the Americas. In Nepal, I roam around past midnight fearing only stray dogs; in India, I secure myself past eight, fearing stray humans. As a person who had lived in Nepal for long stretches and travelled around the world, it’s natural for me to compare — as impartially as possible — various destinations based on my priorities. And on top of my wish list is tolerance of all sorts, which is hard to find back home. The last time I was in India and offered to take a long-lost friend on a drive, her heart missed a beat. Gasping for air, she wondered when was the last time I visited India. “Are you mad? Aren’t you aware of the self-styled moral cops in villages?” she asked. If this is the societal scenario in India’s most literate state — and all in the name of religion — I have no high hopes that my daughter would ever walk in a street without being X-rayed by gawking eyeballs. Public groping in buses and trains, and classrooms and streets seems to be the new normal. Grow up, India. We are a country of hypocrites. Learn a lesson from one of the most impoverished nations, till recently called the only Hindu kingdom in the world. Come to the picturesque lakeside town of Pokhara, Nepal’s most famous international tourist destination where the West meets the East. Or any other inhabited place in this country, which is more Hinduistic than India. There are no sexual predators lurking to pounce on you. No moral police wielding a sword to chop off the hand that holds a female hand. There are no eyes ogling at the scores of women breastfeeding their infants by the roadside. The “humming maid” who came to my rented home crooned the whole day without inhibitions. There’s a trust factor that binds man and woman. When that philosophy of trust gets ingrained in your culture, that nation becomes an abode of peace and tranquility. When I switched from cabbing to bus rides in Pokhara, one day I found myself squeezed in the back of a mini bus. There was no place to sit, except for a little room between two women. I was hesitant when one of them nudged me and gestured to sit. “It’s OK, sister. Hardly any space,” I said. “Come on,” they chorused, almost pulling me into the little space. Call it trust. Those buses have no seats earmarked for women. They expect you to be a gentleman. They expect you to behave. We co-existed peacefully till my destination. Whereas in India groping is so rampant, we may have to build a Great Wall of China between the male and female areas in public buses. There’s no denying this is essentially a long-time visitor’s close observations but there could be undercurrents. “We too have our share of social ills. Sexual discrimination and harassment occur routinely. Patriarchy and corruption are some of the malignancies. We are copycats in terms of fashion, music, entertainment etc. Still, we are a genuinely good people,” confides my Nepali friend, Shama. Nepal, which has 80 ethnic groups and 123 languages, has stayed a lot safer than most other countries, due possibly to the religious nature of the people and their natural kindness. There were hardly any cases of communal bloodshed or hostility towards visitors, except for some recent skirmishes in a southern area bordering India. In India, we kill in the name of religion, whereas in Nepal religion plays a bulwark against bloodshed. Culture plays a constructive role in Nepalese society, binding people with a universal camaraderie. In India, culture plays a divisive role, driving wedges between communities who insulate themselves from each other’s heritage and traditions. Forget the breathtaking sunrise over the Annapurna mountain range, when the peak of Machapuchare glistens in the first rays of the sun. Forget the reflections of the colourful boats anchored in the placid waters of Phewa Lake. It’s the soothing smile of a hospitable people that beckons me to Nepal. Every time I placed an order with the diminutive, ever-smiling waiter — I called him Laughing Buddha — at the Once Upon A Time restaurant in Pokhara for a plate of naan without butter, he would bring them soaked in the yellow spread. He would smile every time I chastised him. My angst would then melt away in his buttery smile. “It wouldn’t be naan without butter, sir,” he would whisper, and flash that smile. 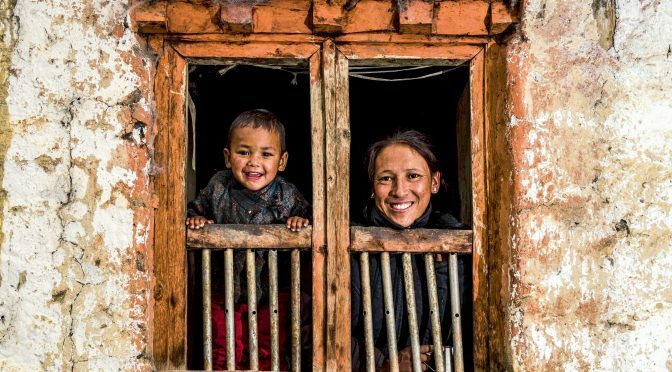 “It wouldn’t be Nepal without these magical smiles,” I would tell myself. Look, my byline’s on a peanut wrapper!